Relax after a hard day's work with the Rubik's® Cube Stress Reliever. Use it to take a break from a rigorous schedule and invigorate yourself. Imprint Area : 1.75" sq. 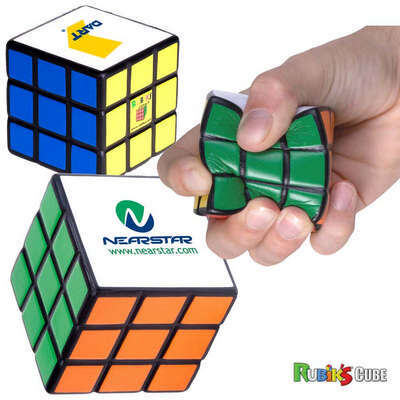 Relax after a hard day's work with the Rubik's® Cube Stress Reliever. Use it to take a break from a rigorous schedule and invigorate yourself. The item is not available blank. It is sold under license exclusively for promotional use and not for retail sales. Stress relievers are not intended to be children’s or pet’s toys. You can customize the cube stress reliever with your company's logo to help advertise your brand better.